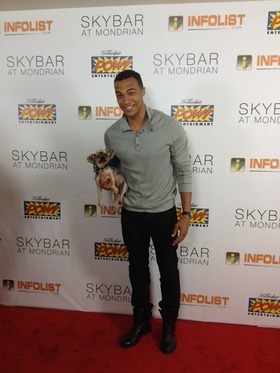 Professional football player and model Dale Moss was spotted at Infolist.com’s pre-Comic-Con Bash on Thursday, July 17 at Skybar at Mondrian Los Angeles in West Hollywood, Calif.
Dale Moss Holds Rescued Half Blind Yorkshire Terrier on Pre-Comic-Con Red Carpet in West Hollywood, Calif. Upon stepping onto the red carpet, Moss played superhero when a small, half-blind Yorkshire Terrier somehow wound up in the Comic-Con chaos. Like Superman, Moss swooped in to save the day and picked the puppy up, protecting him from harm and returning him to safety – after taking a few PAWsitively precious photos with the pup, of course!